An implant is a synthetic replacement for a tooth root that allows the person to have a non removable tooth or a more secure dental restorations. There are several types of dental implants. During consultation, the dental surgeon will recommend the best treatment option and the type of implant to cater to the patients needs. Plate or Blade implants : looks like razor plate, mostly flat and broad. Root forms Implants or root implant: design to resemble the shape of natural tooth, they are usually circular in cross section. Endodontic Stabilizer Implants : original natural root of tooth are retained and an implant screw is drilled right through the tooth. Ramus Frame Implants : usually for people with no teeth at their lower jaw. Transosteal Implants : the procedure, is more complicated, usually not carried out. 3. Intramucosal ( implants are only inserted in the gum tissue , no bone involvement ) also a type of mini dental implants. What about my teeth ? Natural teeth in a healthy well maintained condition is always the best thing one can possibly have. So please do not try or think that replacing teeth with implants are better. Nothing compares to your natural teeth. Therefor it is in the best interest of the patients well being to do everything possible to keep one’s teeth in the best condition for the longest time possible. With good care on the part of the patient and with frequent dental check ups anyone can accomplish this goal. So how can I replace my missing tooth or teeth ? When we loose our tooth, it is best replace the tooth with a non-removable prosthesis as promptly as possible. 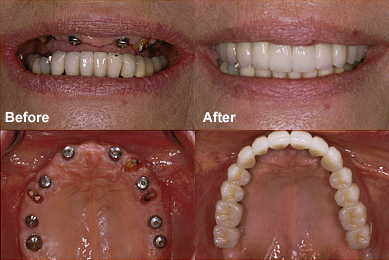 For the replacement of a single tooth, a non removable bridge is often very satisfactory. However, in replacing a number of missing teeth to restore chewing efficiency, a conventional fixed bridge does not increase the support that was present when the teeth is in the mouth. This is due to the fact that the artificial teeth does not have any roots. This is of little concern when dealing with a single tooth replacement. However when two or three consecutive teeth are being replaced or several teeth are lost, this loss of root supports become important. New support needs to be added using dental implants, so that the remaining natural teeth does not bear so much load. What about partial dentures ? Instead of paying so much for dental implants? partial dentures are either tooth supported or tooth and gum supported. An entirely tooth supported partial dentures fill the space , but it does not help the supporting teeth as it was no stronger than before. With dentures that are partially supported by the gum , the gum tissue and bone structure beneath the denture shrinks gradually , so at the end of the day the partial dentures has to be replaced or relined periodically. If relining and replacement are not done, the space develops under the denture and the remaining natural teeth must still carry all the load. The overloaded teeth undergo accelerated bone loss and may eventually drop because of lack of support. Also , unlike an implant a partial denture is removable . When I lose a tooth, what happens to the jaw bone that used to support it? Nature provides bone to support the teeth when they are present in the mouth. When the natural teeth are lost , the tooth supporting bone is also lost gradually. Naturally whatever structure that is not used or stimulated will eventually disappear. For example, a person who is bedridden for a long period loses muscle tone. The muscle becomes soft and wither away. In the mouth , the bones under the gums and the denture gets loose. Notice in the mouth of a person who has lost half of his or her teeth that the bone is still present around the teeth that still remain. Where the teeth have been lost, bone and gum shrinkage is usually observed. However, where implants have been placed and properly maintained, the bone is usually preserved, because the bone is being used in much the same way it was when the teeth were present. 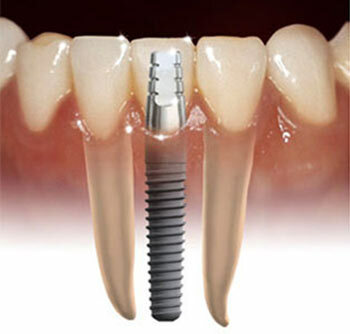 It is a case whereby the good bone level implant is maintained because it mimics natural teeth. How will I be able to chew with implants screws in my mouth ? Chewing with implants. For comparison purposes, assume that a patient who has all of his or her teeth in a healthy, well maintained, functional condition can chew at 100 percent efficiency. With every tooth loss, efficiency decreases. How much decrease will depend on whether or not the teeth are replaced and how they are replaced. Ultimately , if no teeth remain and the patient is using properly fitted dentures on an adequate bony jaw ridge, a chewing efficiency of 15 to 18 percent may be achieved. If the ridges are not adequate, the percentage decreases. However, with implants and non removable bridgework, a person may get back as much as 85 percent of the function they had with with their teeth, depending on the number of teeth present and their condition. This entry was posted in Oral Care and tagged bone level implant, Chewing with implants, dental implants, implant, implants, mini dental implants, non-removable prosthesis, replacing teeth with implants, root implant, Types of Implants on March 19, 2010 by samanthaloh.